The idea of documenting the police at work with my camera was born amidst waves of protests against building a high-speed railway to Guangzhou. As a photojournalist, I was curious how a day in life as a police officer looked like at a time when the government and the police became increasing sensitive towards rallies, authorities kept demonstrators under close surveillance and deployed excess forces to maintain law and order. Did the officers understand what they are doing? Why is this occupation so under-studies? What is our impression of the police force? The inspiration for most of my work comes from the masses that create and shape our social values. But this time I turned my attention to the police force because they represent a government that has an increasingly heavy influence on our beliefs and everyday lives. Perhaps the officers didn’t even think their actions through. Perhaps they didn’t even know their personal values. Uniformed officers have always interested me. They are a picture of professionalism, discipline, intelligence, efficiency and level-headedness – or at least that’s the impression government propaganda and movies try to instill in us. But I can see that they are human too. They eat, they sleep, they laugh and they get angry. They can be foolish at times and wise at others. They might have luck by their side today but not tomorrow. They are just like any ordinary citizen. What sets them apart – and that’s what concerns me most – is that they are armed with weapons and the power to enforce the law. Having observed many police officers at work, I can often feel their internal conflict between job responsibility and personal value. Their vigorous training to work as a team, their submission to their superiors and their close bond with their colleagues all have some bearing on their individual thoughts and behavious. It is exactly this conflict between the police force’s culture of obedience, peer pressure among officers, a sense of power derived from the job and the individual officer’s consciousness that fascinates me. 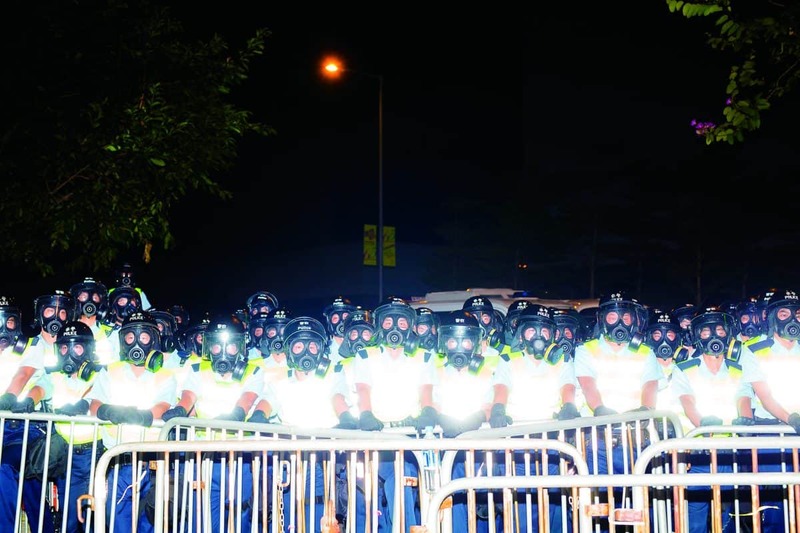 A British colonial legacy, Hongkongers usually address policeman as “Ah Sir’ and policewomen as “Madam”. This form of address is not only a sign of respect but also subordination. Through my lenses, I hope to reveal the less-known side of the police, beyond that deeply-rooted image of superiority and authority. Under Hong Kong’s suffocating political climate, my subject choice is inevitably controversial, and my political stance would undoubtedly come under question. But these aren’t the aspects of my work that I hope the reader to dwell on. Yes, I condemn the police for abusing their power and using excessive force. I object to any police action to suppress speech freedom. I expect the police to stand tall in the face of governmental pressure and enforce the law impartially and civilisedly. But unwilling to let my work be case aside as a clichéd expression of one’s political stance, I chose to leave out most scenes of violent clashes, I don’t only want to explore the psychology and behaviour of the police, but also the potential of journalism and documentary photography. I hope readers can appreciate my photography aesthetically, be inspired to discuss the heated topic critically, and interpret my work from multiple perspectives. As the concept of “the death of the author” has it, it is up to the reader how he or she interpret, critique and appreciate a work. Paul Yeung Tak-ming [b.1978, Hong Kong] graduated from MA in Image and Communication [Photography] at Goldsmiths College, London in 2011. Yeung embarked on his profession in photojournalism for 10 years after graduated from BA of Journalism and Communication in Hong Kong 2000. He was elected to be chairman of the Hong Kong Press Photographers Association [2007, 2008]. He has been part-time lecturer in the Chinese University of Hong Kong, School of Continuing and Professional Studies of CUHK [CUSCS], and School for Higher and Professional Education [SHAPE]. He had received more than 20 awards presented by The Newspaper Society of Hong Kong, Hong Kong Press Photographers Association and Invisible Photographer Asia. He participated in “Count to 12”, a part of “The Road to 2012” project commissioned by and exhibited in the National Portrait Gallery, London . Yeung opened his first solo photography exhibition “The Flower Show”  at Blindspot Gallery in 2012. His works are collected by The Hong Kong Heritage Museum, Library of The Chinese University of Hong Kong and private collectors. Yes Madam, Sorry Ah Sir, by Paul Yeung [Hong Kong] is a Photobook Award Finalist in the Invisible Photographer Asia Awards 2018. View more 2018 Awards Finalists.